Apple’s stock fell nearly 3% in early trading on Tuesday following reports that demand for the iPhone X is weaker than the company expected. 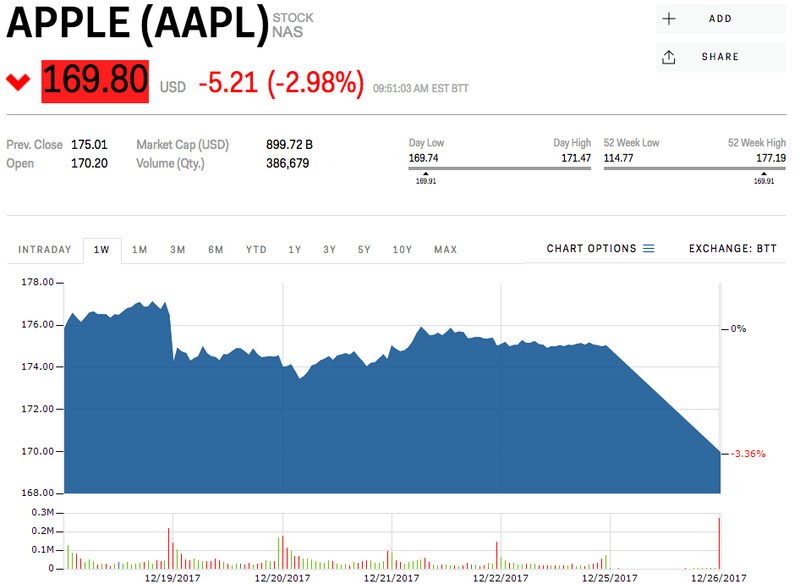 Taiwan’s Economic Daily News reported, citing unidentified sources, that Apple will cut its sales forecast for the iPhone X this quarter from 50 million units to 30 million units. According to Reuters, the Chinese broker Sinolink Securities said the phone’s price, which starts at $US999 in the US, could weaken consumer demand. Trading volume in Apple shares just after the market open was more than double its average for that time of day, according to Bloomberg. This week is expected to be quieter because of the holidays. Apple suppliers including Genius Electronic Optical Ltd. and Pegatron Corp. fell earlier in trading on the Taiwan Stock Exchange.